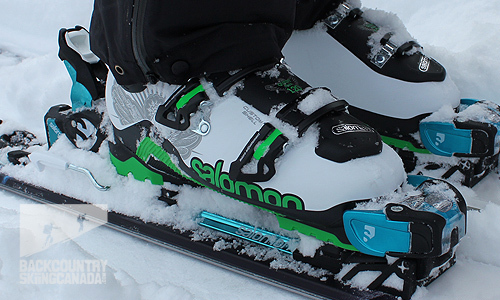 With the release of the Rocker 2 ski family and the Guardian AT Binding, Salomon entered the backcountry market proving that ski touring has become mainstream. Adding the Salomon Quest 120 Max Boots to this line-up Salomon now has all the pieces in place to outfit a backcountry skiing. The Salomon Quest boot line-up includes the 120 Max, 110 Max, 120,110, 100, 90 and an 80 version for the ladies and those looking for a little less weight and beef. 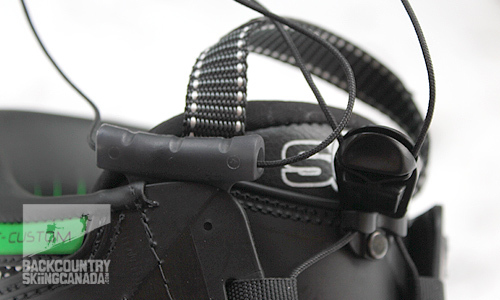 The Salomon Quest 120 Max Boots are the ones we are here to talk about today and there is plenty to tell. The 120 Max boots are an all-mountain touring boot that is aimed directly at the high performance market, gram-counters need not apply. 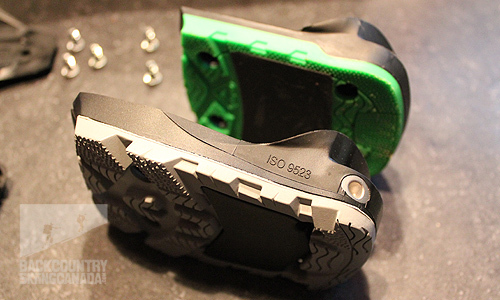 The boots feature Twinframe Technology combined with a unique Custom Shell 360 which actually allows you to custom mould the shell. This three buckle boot has a built-in walk mode for skiers who prefer the slack and side country as it allows quick access to big lines where a hike is mandatory. 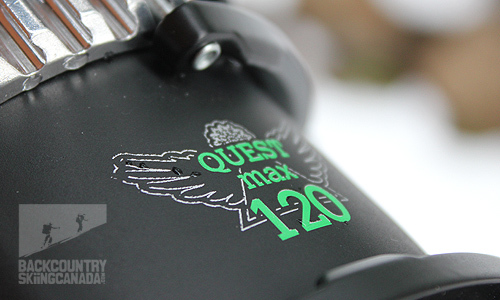 The history of the Quest line was a rocky one with the tech fitting recall a few years back but this new and improved version seems to have added in some improvements sans tech fitting option. The Salomon Quest 120 Max Boots have an improved heel hold with more room in the toe box for better comfort and warmer toes. The strong rear support provides good power transmission and a progressive forward flex allows you to ski more aggressively. Good wrap around tread with replaceable toe and heel pieces (see below for more info). Lacing system with cynch and storage do-hickey. Plenty of thought went into the liners. 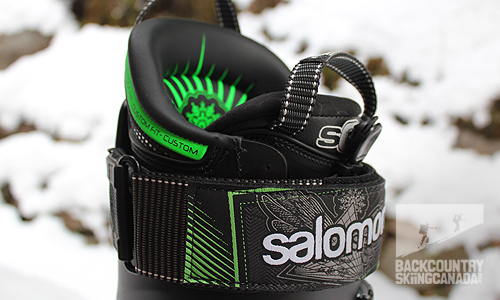 This is Salomon's 3rd generation of custom shell technology. The system works by heating the shell to 220 degrees, stepping into them and then letting them cool for 20 minutes. This allows the shell to conform to your specific foot as it can expand to as much as 104mm in the forefoot. The white lower shell is where the magic happens thanks to its Softer Bi-material Polyurethane material which offers a complete wrapping of your foot and heel and helps eliminate hot spots and improve overall comfort. Do other companies have similar technology or is this unique to Solomon? Salomon's Twin Frame technology combines a more rigid upper PU shell where you need it for control and power with a softer lower shell which provides comfort and a custom fit. The Salomon Quest 120 Max Boots offer a traditional alpine touring walk mode with Magnesium Backbone Technology which provides strong back support and allows for progressive forward flex when skiing downhill. The inner shell also has a V cut-out which enables a wider cuff opening for easier hiking or walking. 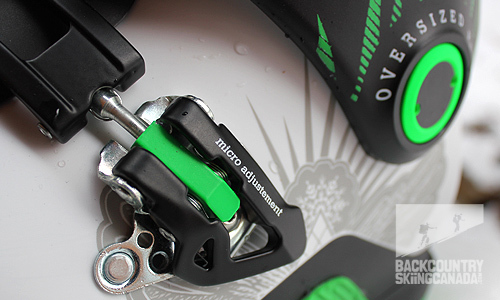 Moments before completing this review we got word that Salomon was releasing an off the shelf tech fitting kit for the Quest 120 max AT boots. Needless to say we had to get our hands on a pair and test them out. 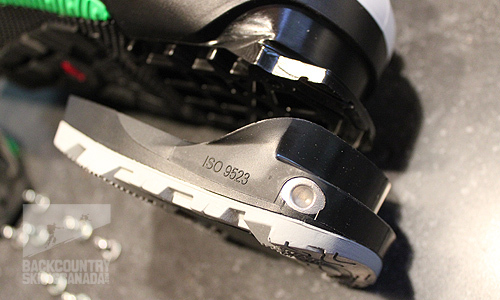 The installation of the new tech toe and heel pieces was a snap and they seemed to have engineered enough strength into the design so that they will stand up to the forces of tech bindings such as those from Dynafit, Plum and G3. We will run this new system for the remainder of the winter and report back if we find anything but a secure stable integration with tech bindings. Good on ya' Salomon for jumping back into the tech world, does this mean that a Salomon tech bindign is in teh works? Greg Hill has been very quiet of late. 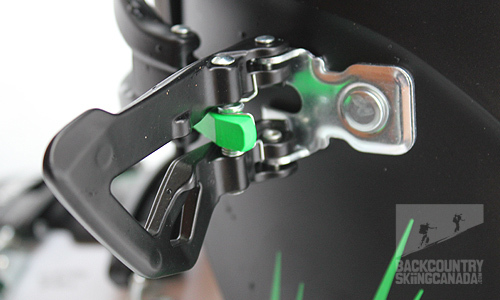 The kit includes two new toe and heel pieces as well as all the screws you need for the re-mount. Standards alpine toe piece with the new tech compatible toe piece. 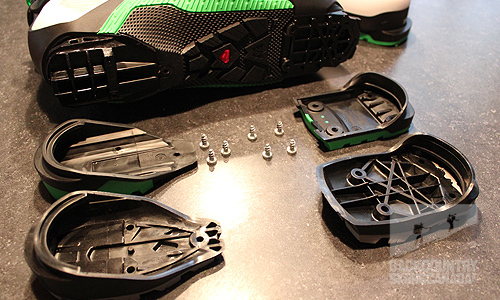 The boot shell has plenty of reinforcement to mount the new tech toe piece. As I mentioned in the opening paragraph this is an all mountain touring boot meaning that it is designed for resort skiing and slack country excursions. This is not a boot for the dedicated backcountry skier looking to put in big mileage day-to-day. At nearly 10lbs per pair these are heavy boots. My other touring boots are 3.5 lbs lighter so I was a little apprehensive to get these out on the skin track, even after an extra large bowl of wheaties. I have to admit though that once on the up track the additional weight was not a huge deal due to the great fit which kept my feet comfortable. Even so, I would place this boot closer to the alpine skiing end of the boot continuum. 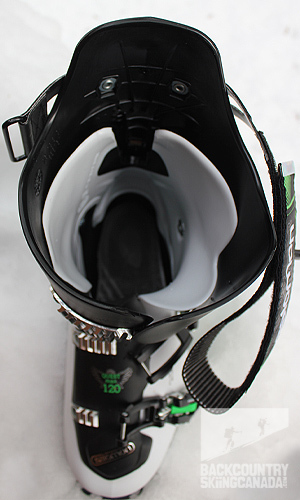 It is a stiff, heavier boot meant for advanced skiers who focus more on skiing down than skinning up. 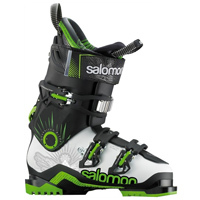 Without standard tech fittings it is obvious that Salomon has their sights set on the younger free skiing market that is itching to get out beyond the boundaries and ski some slackcountry lines. For that this boot is ideal. 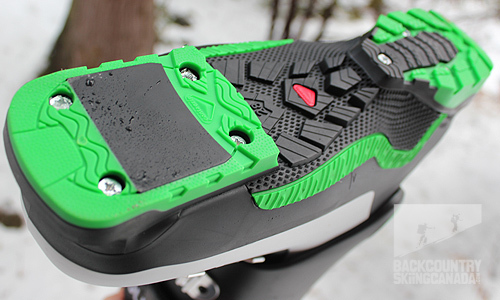 If you prefer to shed some weight then look into purchasing the tech toe and heel kit that was just releasad by Salomon. From a fit perspective I really liked the Salomon Quest 120 Max Boots. They are a big volume boot that feels substantial when you wear them but it is the added room that makes them fit so well. The instep is locked down nicely (once the buckles are adjusted), I didn’t have any pressure points, they are easy to get in and out of and there's plenty of toe room in the box for your digits. 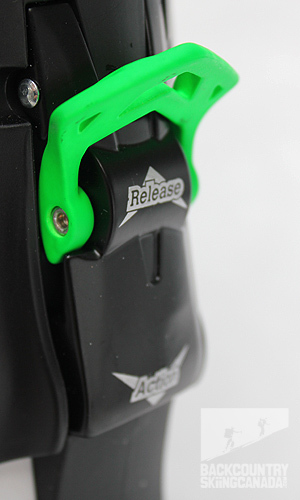 While Salomon touts the 24mm oversized pivot we did not feel it provided any noticeable benefit. The placement of the middle buckle also comes into question for this reviewer as it is not over the instep when you get them out of the box. Luckily they are adjustable and the first thing I did was move this buckle back to rear location for better heel hold. While on the topic of buckles I did find that the top buckle was hard to engage and required two or three re-buckles attempts in order to really wrench them tight. The liner itself is comfortable and comes with an optional lace mechanism which I found provided improved comfort and security. The only down side is that you are left with a lot of extra lace to deal with. 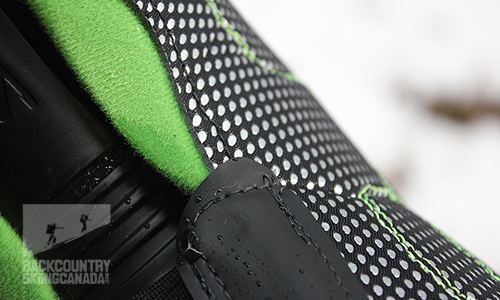 The rubberized piece that helps hide the lace tie off is designed to stick in the side of the boot between the shell and the liner, then the laces get tucked in there as well. Two placement options for the middle buckle. Once in walk mode the Salomon Quest 120 Max Boots did not provide much flex and, in my mind, this is a big draw back for any longer tours. In a stiff boot such as this it is challenging to keep it stiff for the ski and then reduce it for the walk and this is likely where the challenge arose for Salomon. The other beef I had about the walk mode was that due to the flex of the shell one of the boots actually switched back to ski mode from walk mode all on its own. This only occurred while flexing the boot and did not occur while in the backcountry - good thing. Overall, we found that if you are an alpine skier you will be right at home in these boots but if you prefer the "light is right" mantra then you may think you have your skis on even when you don't. 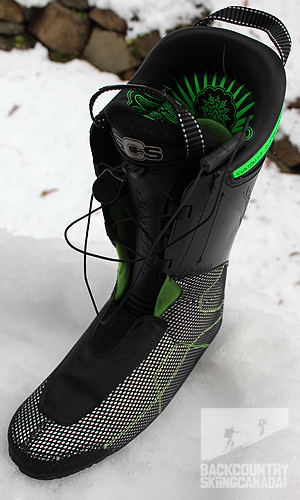 These are stiff boots that ski well but don't have the flex to be great on the skin track and are heavier than most touring specific boots but if you are looking one boot for both in-bounds and out, then this one is worth considering. If you are looking for information on Salomon's new Quest Max 120 BC Boots which are a little lighter, have a read over here. Solid Alpine boot feel with a good fit and relatively easy on /off. Not much flex in walk mode and very heavy for the more dedicated alpine touring folks. The top buckle needs 2 or 3 adjustments to enable it to engage the buckle tightly. Optional lace system is convenient but you are left with a lot of lace left over to deal with.